Tomas Luis de Victoria's first book of Masses, published in Rome in 1576, includes three Parody Masses (or Imitation Masses). These three settings are based on motets by Francisco Guerrero (Simile est regnum coelorum), Cristobal de Morales (Gaudeamus), and himself (Dum complerentur). All three of these Masses, published while the twenty-eight-year-old Spaniard was teaching at his Alma Mater, the Jesuit Collegio Germanic, display both the strength of his own personality, and the influence of Palestrina. The general musical language is that of classical "Roman School" polyphony, but specific moments of drama contain more abrupt melodic gestures than would be found in the music of Palestrina. The style of his treatment of his model, likewise, displays both the techniques of common practice, and the stamp of individuality. 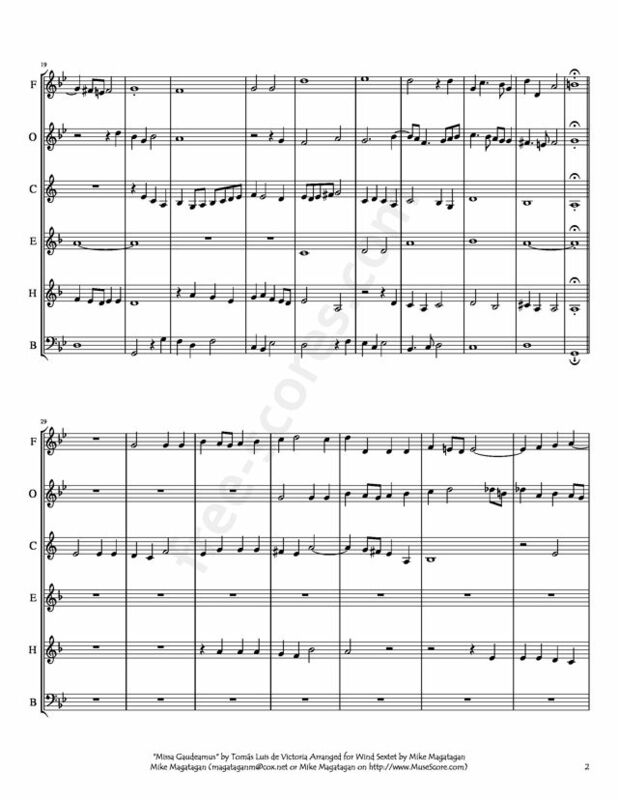 The standard Sixteenth-century practice of "Parody" in a Mass setting requires each major section of the piece to begin with a recognizable musical allusion to the model composition, and conclude with closing material from it as well. In the Dum complerentur Mass, Victoria acknowledges such conventions, but also demonstrates an easy facility with the handling of his own music. The model composition is his own motet, its text suitable for the Feast of Pentecost. To the motet's original five voices, Victoria adds a sixth in this Mass. As convention would have it, several movements (Kylie I, Gloria, Sanctus, and Benedictus) all approximate the opening of his motet, and the Credo opens with material from the motet's second part. 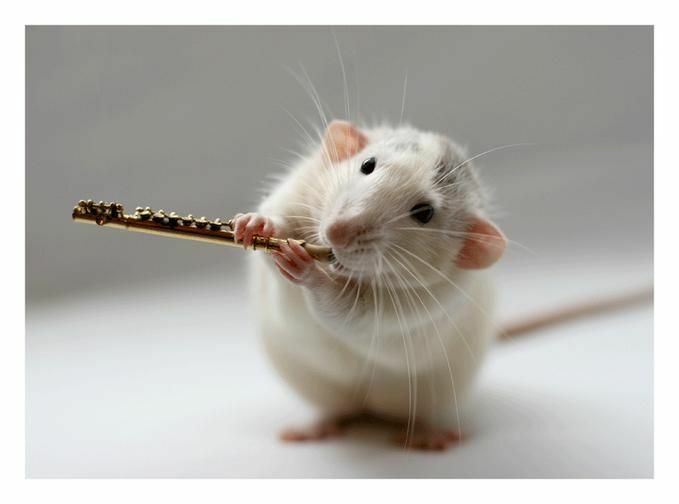 But each movement opens not with a classical Point of Imitation, but rather with a clever reworking of several elements of the contrapuntal texture. In general, the order of voices is shuffled, and the most important motivic material throughout the Mass stems from a pair of subsidiary motives from the model, countermelodies to the motet opening. What appears to be the principal motive of the model actually opens only the Benedictus. The opening of Sanctus, heard twice in long tones drifting above the other voices' foundation, just suggests this head motive. Agnus Dei I and II return to Victoria's favorite subsidiary motives, with the novelty of setting paraphrases of both simultaneously. Already this early in his career, Victoria evidences a tightness of detail concurrent with a developing freedom of formal structure, both of which combine in a piece of fervent individuality. 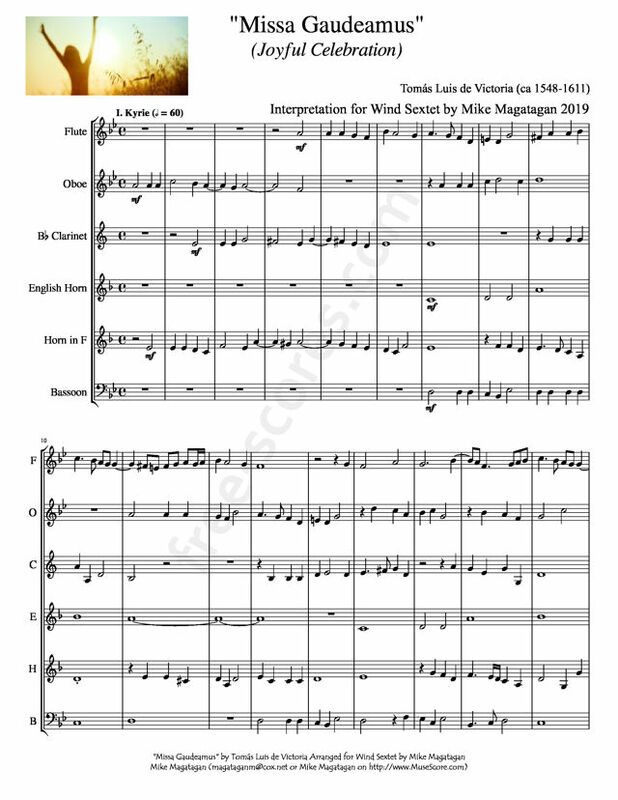 Although originally created for five (6) voices (SSAATB), I created this Interpretation of the "Missa Gaudeamus" (Joyful Celebration) for Wind Sextet (Flute, Oboe, Bb Clarinet, English Horn, French Horn & Bassoon). 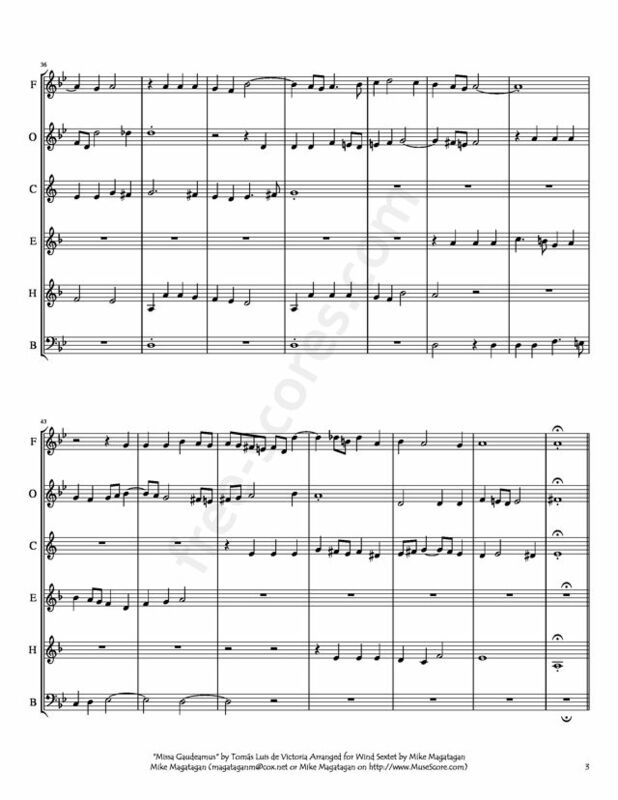 All Edward Elgar orchestra sheet music.